We have exchange programs shown in the following table. Six months have passed since my arrival at San Diego State University (SDSU). I would like to explain what SDSU is like by describing its scale, organization, the exchange program’s curriculum, and my personal impression on studying at SDSU. SDSU is in the city of San Diego, which happens to be the southernmost city of California. At first glance, because of its name, you may think it does not seem to be a part of the California State University (CSU) program, but it actually is. At SDSU, there are over 30,000 students including graduates, undergraduates and international students. SDSU has the largest student body in the entire West Coast region. The majority of international students attending SDSU are Japanese. There are about 170 Japanese students including exchange students. SDSU provides 74 Bachelor, 55 Master, and 10 Doctorate programs. SDSU has many popular Humanities and Science courses; however, it does not have a school of medicine. 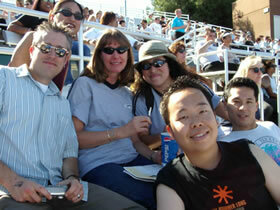 The curriculum for exchange students is very flexible and gives priority over regular SDSU and international students. Exchange students are allowed to take any class at any level depending on the professor’s permission. For example, I am taking a graduate level class although I am an undergraduate. Many exchange students from Japan majored in English Language at their universities, but all of them do not take courses that are associated with their majors at SDSU. For example, some of them have taken Aerospace Engineering, Political Science, Accounting, and Economics. Many students may think that they have to take courses associated with their majors, but it is not necessary for exchange students at SDSU. Life as an international student is harder than I expected. Compared to American students, I did not learn English as my first language, so it takes more time to prepare and review materials for my classes. Furthermore, since American universities encourage in-class discussion, more preparation is required. 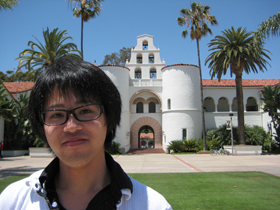 At SDSU campus with Brent, a 2003 excange student candidate to Gunma University. Because of these difficulties, I even had to study on weekends to be prepared for classes. However, I am no longer subjugated to routine weekend study sessions, and now have time to pursue recreational activities. Studying at SDSU is very interesting although it involves many difficulties of a foreign culture and its language. Since a lot of students from around the world are studying at SDSU, I can interact with many other cultures and broaden my knowledge about the world. I am able to learn something new every day that I would have been unable to learn in Japan. I feel the time I have spent at SDSU has been very short, but I have actually been here for a long time. I still have many things I want to do. I would like to retain many of the experiences I have had during my time at SDSU. Lastly, I would like to thank all the people who made it possible for giving me such an invaluable opportunity to experience life as an exchange student. As an international student, I studied at San Diego State University (SDSU) of California in the United States from August, 2007 to June, 2008. San Diego, where SDSU is located, is one of the safest cities in the U.S. and has a comfortable climate all year around. It has great scenery because it is located along both the Pacific Ocean and the border with Mexico. It has many interesting places to visit, for example, world-famous San Diego Zoo, many shopping malls, etc. Therefore, San Diego is the optimal city for students who would like to realize a fruitful studying abroad. During this exchange program, I studied about an academic field, linguistics, which investigates the human language scientifically. SDSU provides really many other fields, though. I was required the much more amount of reading than that required in a Japanese university. Through reading many English texts, I could relearn various kinds of grammatical items and increase the number of vocabulary; and as a result, I could become to speak English more smoothly. For everyone who would like to study abroad, I strongly recommend his/her reading as many English texts as possible, whatever genres. I had difficulty in the difference of the learning styles between Japan and Australia. Compared to Japan, students in Australia have a lot of exams and essays, and their essays should be in the proper format like thesis. However, even though I had struggled with these exams and essays, I did enjoy the life in Australia and did lean more than what I had expected before going there. Also, it supported my life to communicate with people whose background were not English speaking countries and lead me to understand English more deeply. Since there were many different aged students in Macquarie University, the communication with those people provided me with wonderful time. I think that it is quite valuable and essential to listen to the opinions or views from other people and to discover new vision for our future. In order to study abroad or to become exchange students, it is necessary to take TOEFL examination and pass it. Though it might be difficult to take examination and have experience in another country, you definitely have awesome experience. If you are interested in studying abroad or being exchange student, just start taking TOEFL examination! More than two months have passed since I arrived to Japan. From decrypting kanji’s to eating a variety of new foods, everyday has been interesting and I have learned so many great things. The first couple of days were the hardest days because my ear was still averse to the language despite having studied the language for two years. This is the first time I live myself, away from my parents for a very long time. Living here has also taught me how to live in the adult life. That is, paying for my own expenses such as food, household supplies, the rent for the apartment, utilities, services, and any other thing that are needed to live in society. I had to readjust my spending habits to cover expenses that my parents would normally pay for. There are also other activities that I never did back home such as riding a bike. I basically use my bike to ride everywhere I need to go. At times, I get very tired because of the long distances I have to cover. In addition, everyday gets colder and colder, more than I am use to. However, I see these things very beneficial to my health since I am forced to exercise every day. I also have to cook everyday and find bargain deals at the supermarket instead of just grabbing whatever I want. Without a doubt, I have matured a lot during these two months. During this time, I have had several wonderful cultural experiences in Japan. One of them was being able to participate in the Maebashi City Festival. Together with the other international students and Japanese students, we participated in the activities of a local temple. It all started with an opening party, where we ate, drank and socialized with the elders. The following two days, along with the temple community, we helped pull a decorated car along the streets of downtown. We also carried a very heavy mobile shrine over our shoulders. It was a very difficult task to do, but I felt full of energy after we finished. The food and drinks that were served during those days of intense physical activity were very delicious and replenishing. I met many people and had a lot of fun with everyone. The following weeks, I took two cultural classes that were being offered by the university`s international center. The first one was the Tea Ceremony in which a short presentation of the history of tea preparation was given. Following that, the same ceremony was conducted in a specially arranged room within the University. Two types of teas were prepared, one being a bit thicker and stronger than the other. While everyone else complained about the taste of the tea, I really enjoyed it. I guess that the only difficult part for me was sitting on top of my legs. After the ceremony, it took me several minutes before I could walk again. The second cultural class was Japanese calligraphy. I was looking forward for this class from the very beginning. I have always gazed with admiration at the scrolls and paintings that contain such characters. They express so many indescribable meanings within every brush stroke. When I took the class, I discovered that it wasn’t as easy as it looked. There are so many details to take under consideration that you don’t even worry about when writing with a pen. This class has inspired me to continue with calligraphy in my spare time. The first weeks of classes were very difficult to survive; I just didn’t know what I was doing. My homework took many hours and even days to complete because there were so many kanji’s and grammatical patterns that I didn’t know about. Besides, classes are held in Japanese with very minimal English assistance, and in a way, that was the key to force a rapid adaptation in a Japanese curriculum. As of today, I can read and look up words faster, I can hold short conversations in Japanese and understand conversations. These two months have been very productive and have had a great significance in my language development since I’m practicing every day. Ever since I started taking Judo, my physical strength has increased. I have realized that even if your opponent has a greater force or body weight, using the right technique can lead you to victory. I must admit that the training is quite hard and sometimes painful. But I have already noticed an increase in resistance and some muscle development in new parts of my body. In addition to my regular judo class, I also joined the Judo club in which I am able to practice and learn ahead of the class. To this day I have really enjoyed my stay at Maebashi. Two months have passed since I came to Japan. After arriving in Maebashi, I started attending classes in Gunma University and joining activities intended for exchange students. This is my weekly schedule. Monday. Comprehensive (grammar, reading, speaking) Japanese class. Yashiro Sensei. During comprehensive Japanese classes, we have a different topic for each textbook unit, hence we study lexis and expressions in relation to it. Besides, we also study phrases and grammar we find within the reading. Last week we completed our intermediate level textbook and entered the advanced level. Therefore, in addition to the textbook, we read and analyse newspaper articles. Before starting a new unit, we take a small quiz. Tuesday. Japanese traditional art. Sakai Sensei. In this class we practice Japanese art by painting and drawing with traditional colours and techniques. After lunch break, conversation A class. Inokawa Sensei. Here we practice by creating conversations, both formal and casual, which can be useful in everyday life. Then, writing class. Tanaka Sensei. Tuesday’s writing class is intended to provide knowledge of phrases and grammar suitable for written Japanese by writing short sentences. Wednesday. Japanese culture class. Noda Sensei. Here we study mainly Japanese history and social situation of past Japan. In the afternoon, writing class. Hagiwara Sensei. Differently from Tuesday’s writing class, in this one we write longer compositions. Then kanji class with the same teacher. Every Wednesday we have a quiz about kanji learnt in previous week lesson and then we listen to news and, while doing it, we must try to note as many kanji and katakana words as we can. We take a quiz about these words in following week class. Thursday. Comprehensive Japanese class. Tsubana Sensei. We go on with Monday’s class. With the same teacher, conversation B. Conversation B is different from A since here we prepare speeches and learn to speak Japanese in front of an audience. Friday. Japanese art class in the morning with Sakai Sensei. Then, we carry on with Thursday’s Comprehensive Japanese class with Sema Sensei. Besides classes, we have joined activities related to Japanese culture like tea ceremony, Ikebana and calligraphy. During week-ends, I am trying to do a little sightseeing. For example, last week-end I went to Ikaho onsen for the first time. Furthermore, we I am at home, I always have a good time with Song Ai and Lei Miao Mei, two Chinese exchange students I have met here.